Ten Things Worship Dancers can Learn from the School Dance Team and What I Wish Every Dance Team Member Knew. Young people want to dance. There were 250 students in this performance. Clearly there is a need and a desire for dance leaders and teachers. If you have ever wondered if you are called to reach the youth at your church, take time to pray and listen for that call. There are young people out there who want to dance and are looking for an avenue to develop their gift. Will you help them? We need to invest in our own training. There are skilled young dancers out there. If we want a voice in their lives, we need to take the art of dance seriously and invest in our own training. This does not mean we can not speak to them until we can outperform them with our technique. But we need to be growing, learning, and gaining skill. It is our anointing that ultimately will enable us to have an impact on their lives, but having skill gives us credibility as well as something to offer them. What you are doing matters. These kids are going to use dance for good or for evil. If we have the chance to plant seeds for righteous dancing, it could change the trajectory of their lives as well as all the lives they will impact through dance. Get boys into the act. Women bring beauty, passion, gentleness and refined strength to dance. Men bring strength, humor, power. We are, together, made in the image of God. Dance is more complete, more impactful when you have both men and women dancing. I’m speaking to myself before I’m speaking to anyone else. I’m in my comfort zone with women and young girls. They think like I do, and they dance like I do. It’s comfortable for me to reach them. But this year I’m going to make it my goal to learn to dance with men, to learn from them with the intent that I can bring boys into dance. Give your dancers something awesome to wear. The kids I saw dancing must have had a ball changing from costume to costume. Their costumes were fun, beautiful, playful, sassy, exciting, and sometimes provocative, depending on the dance. Now, our standards are not the world’s standards, and we are going to teach our dancers to cover up. I said more about this in my earlier post. Even so, these kids, especially girls, want to look beautiful and feel special. In my children’s dance curriculum, I have a whole lesson on teaching kids the difference between empty (vain) dancing and full (worshipful) dancing. So I’m not talking about catering to their vanity. I’m talking about meeting their God-given desire to be lovely (for girls). You can choose modest garments that are also fun and flattering. Don’t ask them to dress in something that looks like a potato sack. Lucie Poirier says, in her book Dancing for the Endtime Harvest that we are to dance for “beauty and for glory.” For an excellent resource on praise dance garments, I highly recommend Jocelyn Richard’s e-book Garments of Glory. In short, we are fighting for the hearts of our young people. As dance ministry leaders, we have something to offer that they want and need. They want to dance, both boys and girls. The girls want to be beautiful.What is more beautiful than a dancer who is dancing out their love of the Lord? The enemy is seductive. He’s offering them a very alluring counterfeit. We have to be wise and strategic. We need to take our art seriously, so that we have credibility. We need to realize that young people have other options than to dance with us, so we want to take their needs into account, so that they want to dance with us. I can help you teach young people how to use their gift for the Lord. 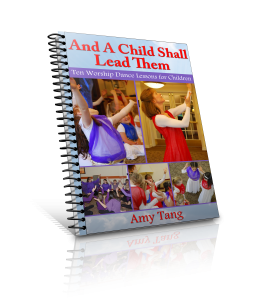 My kids praise dance curriculum will give you all you need to get started. Check it out here. When was the last time you got out in your community and saw a live performance? This is the time of year for dance team performances and for dance recitals. Take advantage of it. You’ll be inspired, I hope, and you’ll learn something. You may also find you have a renewed conviction about the message you have to share.